**I am truncating this post because it is quite long with lots of photos. Please read on to see more! 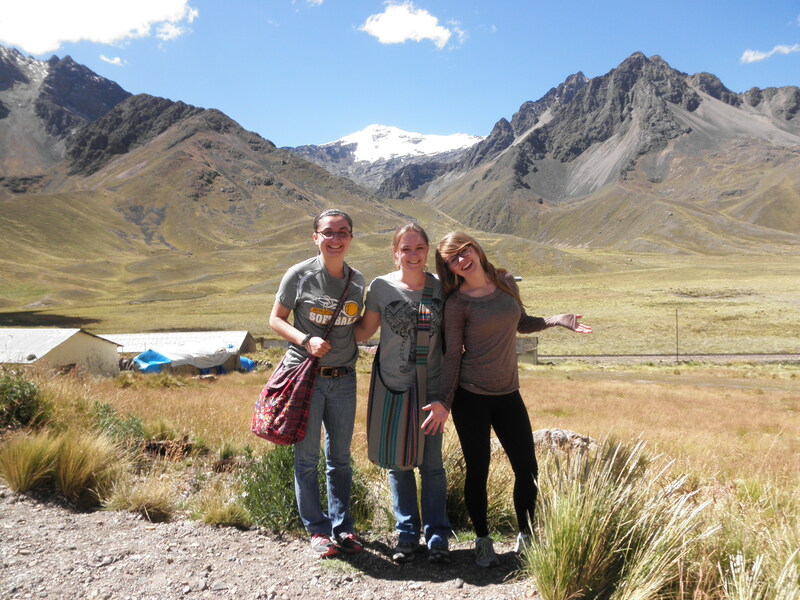 We departed from Mery’s house early in the morning to head to the bus terminal with all of our luggage (we all accumulated more stuff while in Cusco). We boarded the bus by 7 AM. We took a large tour bus to Puno. It was a 10-hour trip, but we made 5 stops, so it wasn’t too bad. 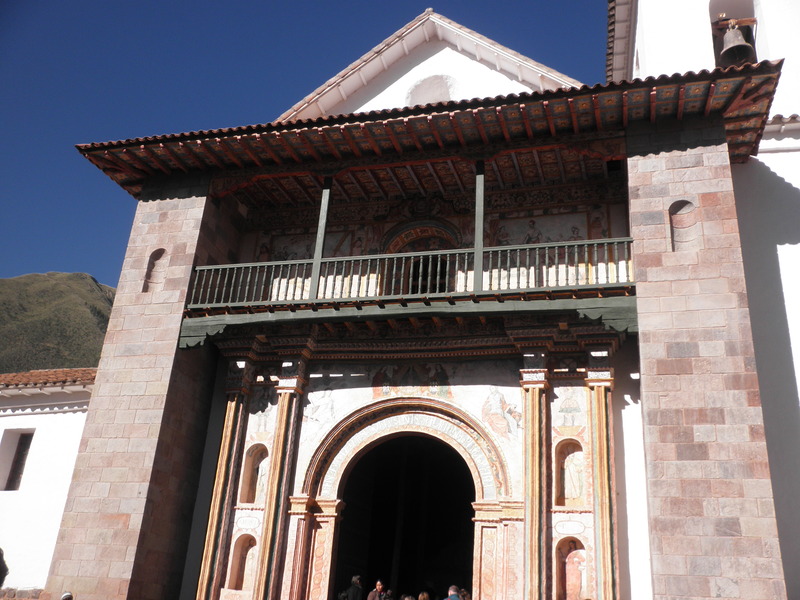 Our first stop was Andahuaylillas, a church that is often called “The Sistine Chapel of the Americas” because of its amazing murals on the walls and ceilings. 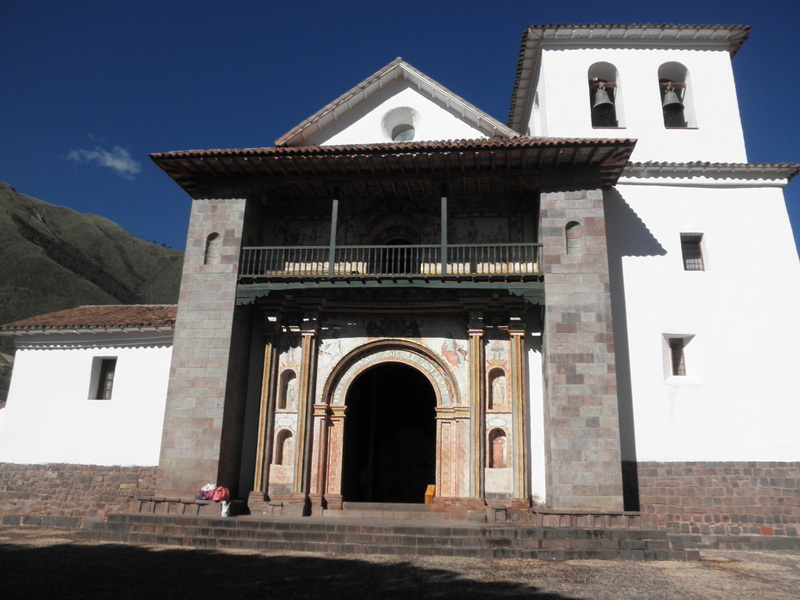 It was originally built by the Jesuits, who commissioned the murals, and for awhile was owned by the Dominicans during the time the Jesuits were driven out of Peru by the Spanish because they had gained too much power. After the Independence Revolution, the Jesuits returned and regained ownership of the church. Because of the two different influences, there are two altars and two pulpits with very different styles. The Jesuit altar/pulpit is covered with murals, while the Dominicans built an intricately carved wooden pulpit. Unfortunately, we weren’t able to take pictures inside the church. Another interesting part of the church is one of the doorways, where “I baptize you in the name of the Father, Son, and Holy Spirit” is written in five different languages: Spanish, Latin, Quechua (still spoken by the indigenous people in many parts of Peru), Aymara (still spoken in some areas of Peru near Lake Titicaca), and Pukina (now extinct). 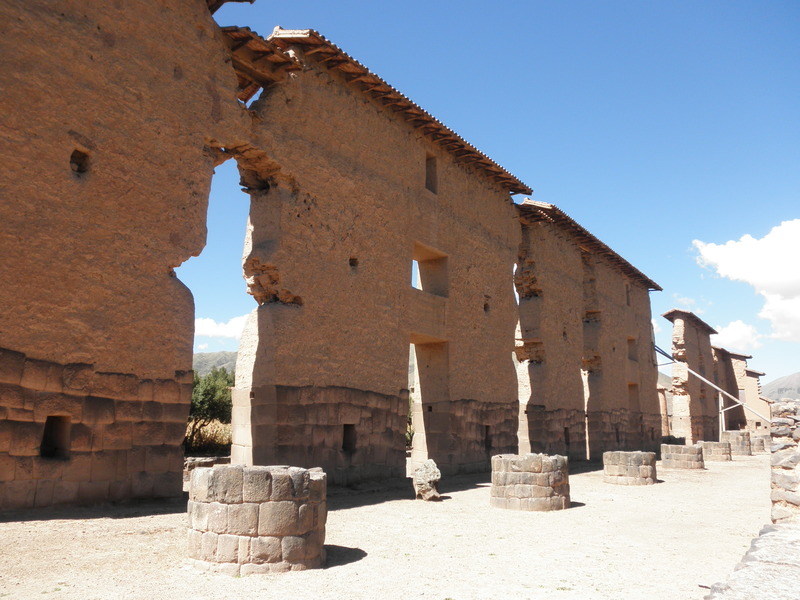 From there, we headed to Raqchi, another Inca site. 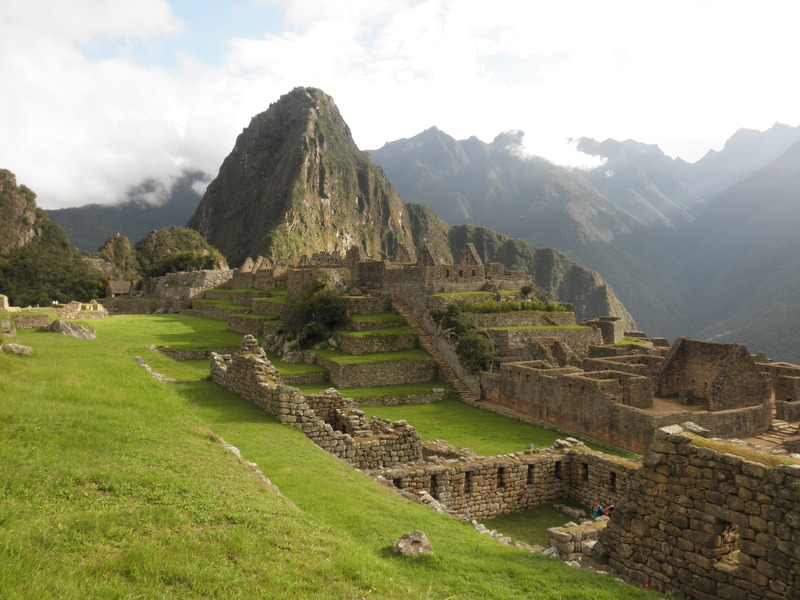 This Inca site was unlike any of the others we visited while in Peru. 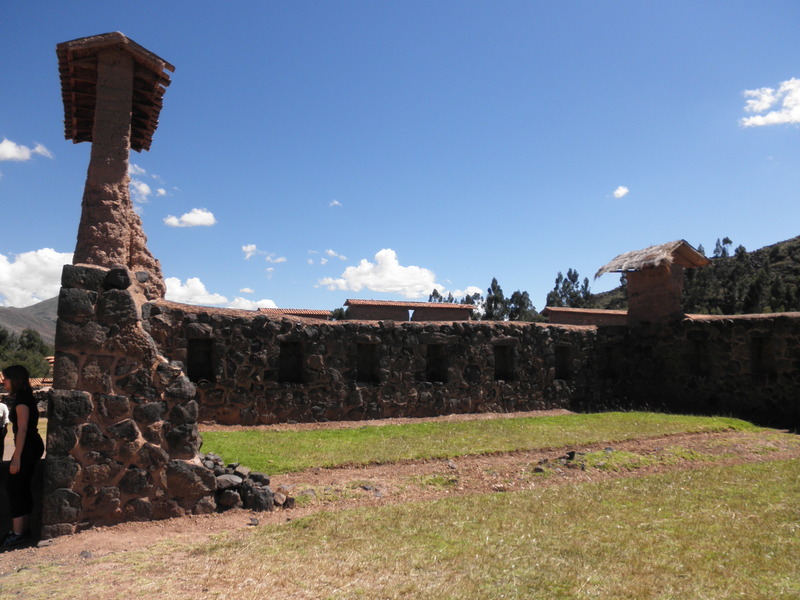 There is a large temple with high walls using a mix of stone (typical of Inca construction) and adobe (this is the only Inca site where we saw adobe used). In addition, there are 22 large columns that once held up the roof of the temple. 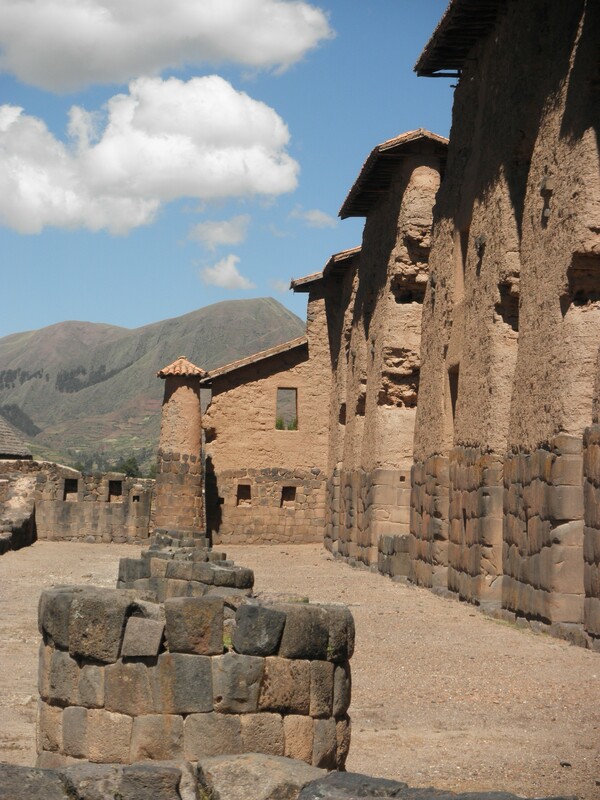 According to our guide, this is the only place the Incas used columns in their construction. 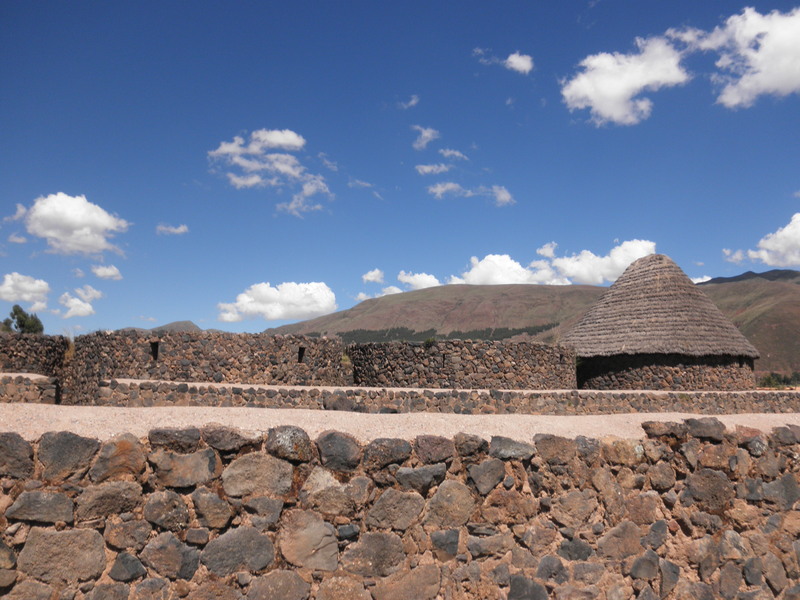 The temple was built because the people the Incas conquered had difficulty believing in an invisible god. 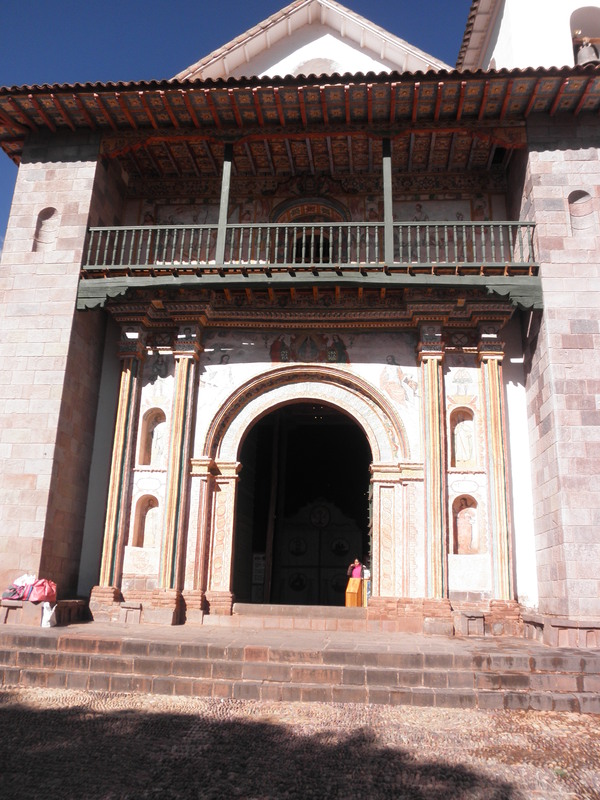 Pachacutec, the Inca king, built the temple so that a large painting of the god could exist for the people to see. There was also a city here and some of the buildings still stand. 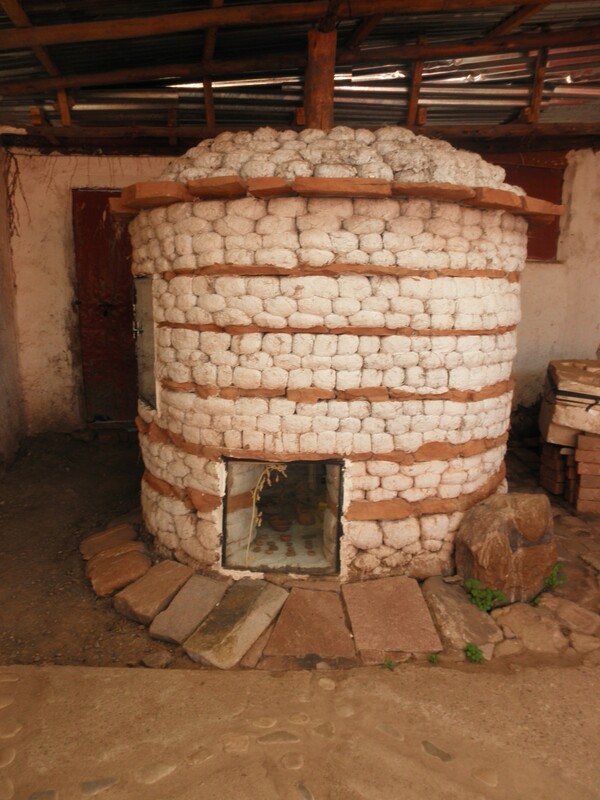 In addition, there are many circular buildings, which were used to store the food that the Inca people were required to pay for taxes. The food was then used in times of drought or famine. There is also a large “Great Wall” surrounding the city to protect it from attackers. We then headed on to a nice restaurant in the country for lunch. There was a buffet, so we were all able to eat of fill of traditional Peruvian dishes. 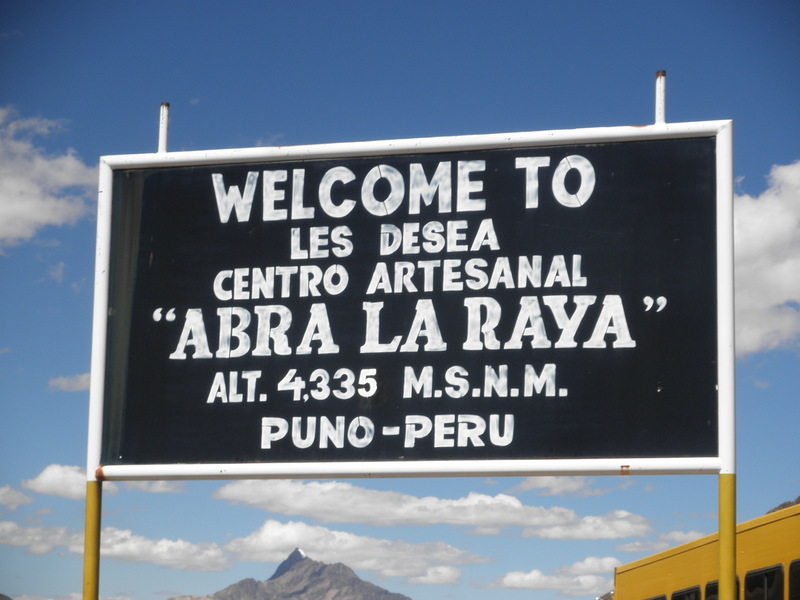 After another hour or so on the bus, we arrived at “Abra La Raya”, a small artisan marketplace with amazing views of the valley. 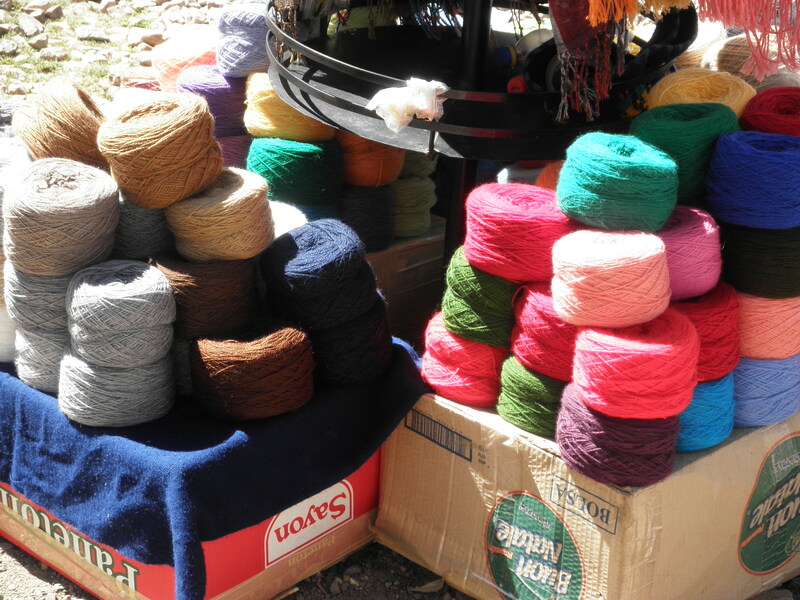 I bought some yellow alpaca yarn there. 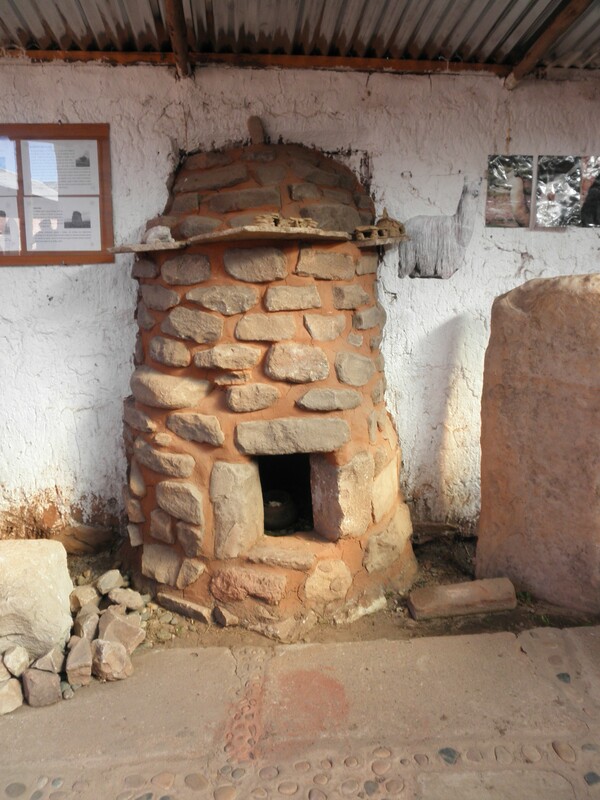 From there, we went to Pucara, a town well-known since Inca times for its ceramics. 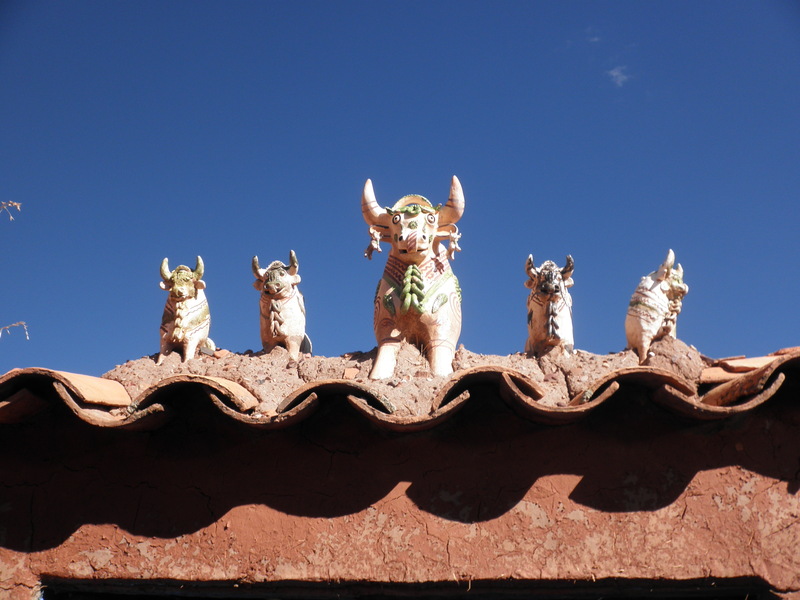 Today, it is where many of the ceramic bulls found throughout Peru are made. The bulls are placed in a home to protect the home and those that live there. In Inca times, llamas were used, but the Spanish changed it to bulls. 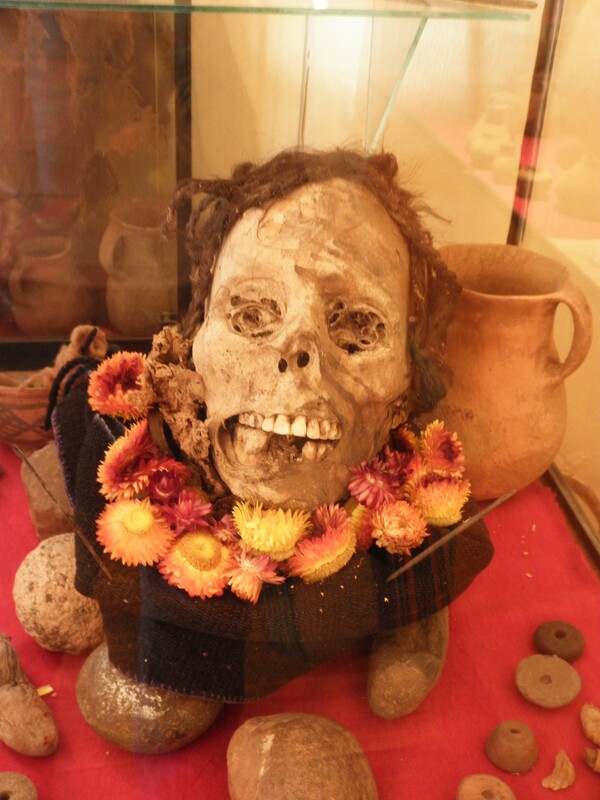 There was also a small museum there, where we were able to view a few Inca mummies. 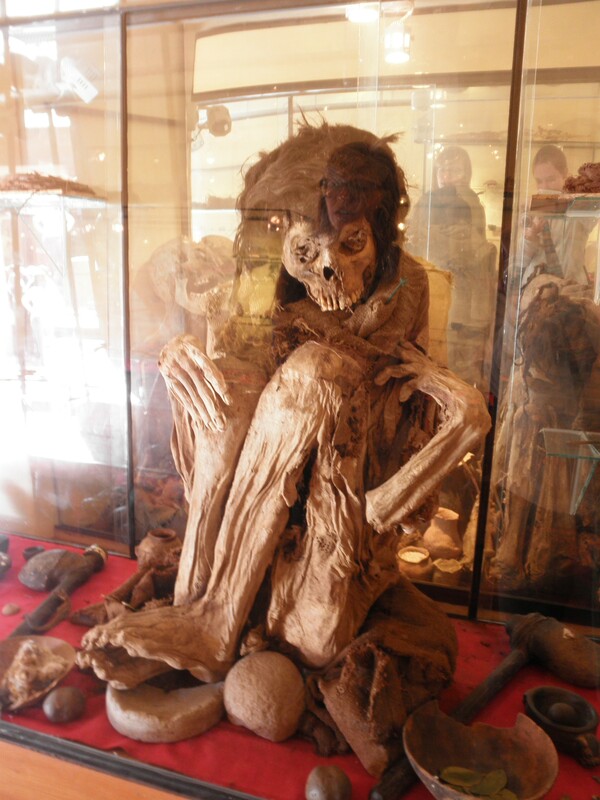 The mummies were entombed in a fetal position because the Incas believed that you should return to the earth in the same manner you are born. 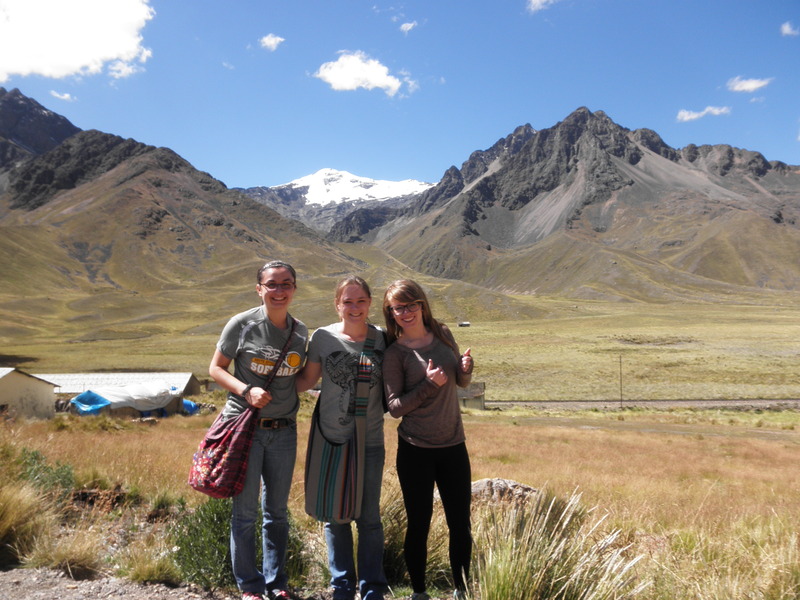 After another hour or two on the bus, we arrived in Puno and took a van to our hotel. 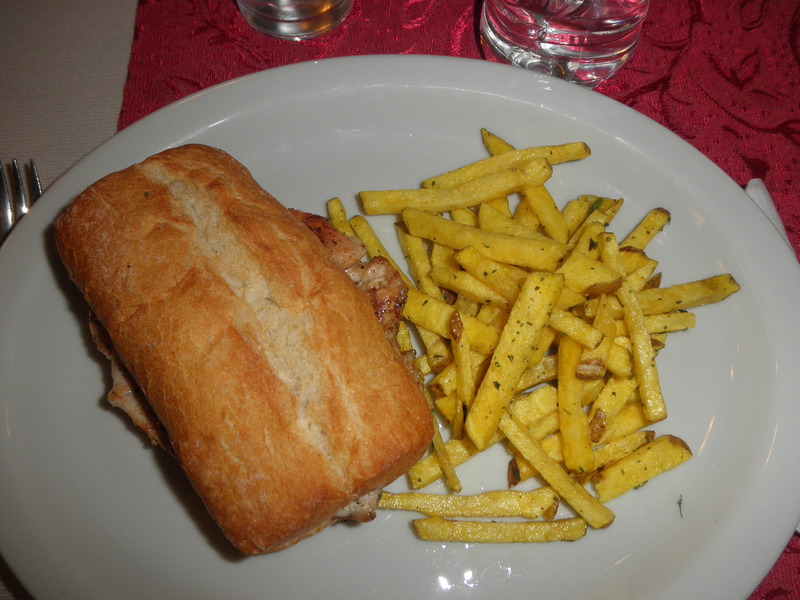 After showering and taking advantage of the free wifi, we ate dinner at the hotel restaurant. After dinner, we played some cards, then repacked a single backpack for our 2-day trip on Lake Titicaca.